When it comes to finding a wine to match any particular cuisine, those of us dining on Western dishes are, arguably, in a stronger position than those tucking into Asian foods. The reasoning behind this sweeping statement isn’t particularly complicated. European dishes have, by and large, evolved alongside local wines and so tend to complement each other. If you’re stuck for inspiration when looking for a suitable match for, say, spaghetti bolognaise, you’ll find that the kind of wines made in northern and central Italy, by and large fruity reds with fairly high acidity (for instance a Barbera d’Asti, a Rosso Conero or a Chianti) will do the job perfectly well. Likewise, a glass or two of Cahors washes down a rich cassoulet; a slice of jambon persillé works well with a rich Burgundian Chardonnay and, at the simplest possible level, oysters from Brittany find a perfect companion in a refreshing Muscadet while those from Bouzigues are at their best with a bottle of the local Picpoul de Pinet. It’s important to remember that extrapolating from local wines can only take you so far (delicate Mosel Riesling and a plate of Weisswurst, sauerkraut and boiled potatoes might not be a match made in heaven, at least not in my book), but it’s still a pretty good rule of thumb. But what about finding a wine to match the Asian cuisines that have become so popular in recent years? Back in the days when all Indian meals came in the form of generic curries and Chinese dishes were largely flavoured with monosodium glutamate and not much else, it didn’t really matter. You drank beer with one and tea with the other and that was an end to it. And as for Japanese food, the answer was obvious: a little flask of warm sake was the only way to go. These days our Asian restaurants, and the dishes they serve, are far more sophisticated than they used to be, and while this is good news, it leaves most of us floundering when it comes to finding a wine to accompany our meal. Riding to the rescue comes an unlikely knight on a white charger in the form of Berry Bros’s Nick Page. Currently the manager of the Berry’s Factory Outlet, Page has a background in wine education and now runs the company’s food- and wine-matching courses. You can go along and find out how to match wines to French or Italian food, of course, but I thought an evening spent matching wines to Japanese cuisine would pose far more of a challenge, so I joined a group in the Pickering Cellar one evening in April to see how Page’s recommendations stacked up. Page kicked off the evening on the starter slopes, by discussing the basic principles of food and wine matching. 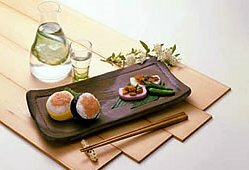 We talked about balancing sweet, sour, salty and bitter flavours, along with that of umami. The notion of Umami is a fairly recent one, but the best way of describing it is that it is savoury, a flavour that can be found in soy sauce, Parmesan cheese and in the notorious MSG (monosodium glutamate). Page showed us how sharp flavours could balance sweet ones and how bitter flavours can throw sour ones into sharp relief. We also talked about how Japanese food tends to be low in acidity, and how this can have an impact on the wines chosen to match it. Left: foods high in glutamate, and the flavour of Umami. Once Page had outlined the basic elements of his approach to matching wines and foods, we moved on to the actual tasting part of the evening. First out was a bowl of miso soup, high in umami flavours, which we tried with a Fino from Lustau and an Amontillado Fino from Miguel Fontadez Florido. While the Fino highlighted the flavours of the seaweed floating in the broth, the better match was the Amontillado Fino, which brought out a richly savoury depth to the soup. Next came the sushi course, which consisted of a plate of tuna, prawn and salmon nigiri, along with an avocado and shitake maki roll. These had been paired with Lustau’s Papirusa Manzanilla (which was, sadly, so oxidised that we didn’t get a chance to test its mettle as a match), Berry’s own-branch NV Champagne and its own-brand vintage Champagne from 1999, along with a 2005 Gewurztraminer from Domaine Lucas and André Rieffel in Alsace. Two revelations emerged from the sushi experiment. The first was that the combination of pickled ginger and Gewurz is an absolute, must-try revelation, my favourite flavour-pairing of the evening. The second was that, in terms of an all-round match for sushi, vintage Champagne knocked the spots off all the other wines combined. Although NV Champagne might work well with the raw fish by itself, when you factor in the slight sweetness of the rice, the wasabi and the soy sauce, the extra depth and richness that came from the ageing of the vintage fizz really gave it the edge. Gyoza, small dumplings filled with minced prawns, had been paired with a Séguinot-Bordet Chablis 2005, a Lustau Palo Cortado and a 1998 Viña Arana Reserva from La Rioja Alta. The Chablis was a poor match, its neutral flavours fading into the background when confronted with the sweetness of the prawns. 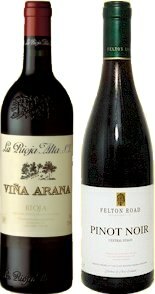 I thought the Rioja was an unlikely match, and so it proved: although the coconut aromas of the oak gave the impression of sweetness, the wine was bone dry and stripped the dumplings of their flavour. The Palo Cortado proved to be the best match, although I felt it fell short of being a good pairing as the wine dominated the dumplings. The final pairing of the evening was to be with a plateful of chicken yakitori skewers, which were served alongside a bowl of seven-spice powder that proved to be so hot as to be virtually inedible – a definite no-go area with any kind of wine, in fact, as the chilli stripped all the wines of their fruit. The sweetness of the teriyaki marinade meant that the most appropriate wine matches would tend to have a fair amount of fruit ripeness to them, and so it proved. The first wine up was the Viña Arana from the previous course, which was a horrendous match: the wine was simply too dry to work well with the teriyaki sweetness. Next up was a Lambrusco, whose sweetness complemented the chicken’s flavours quite well but failed to have the staying power to make a really good match. The final match was the best pairing of the course: a 2006 Felton Road Pinot Noir from Central Otago that had the depth of flavour to complement the skewers perfectly. Overall, I found some of the pairings more miss than hit – and there were some styles of wines we didn’t try that I felt might have proved better matches than some of the wines we did try (I thought a Marsanne/Roussanne blend from the northern Rhône, for instance, might have made a better fist of the sushi than some of the wines we tasted). What I did get out of the evening, however, was a better idea of the principles behind why some matches work better than others – and a chance to taste some of the wines in the Berry Bros portfolio alongside some good Japanese food. In my books, that’s an evening well spent. 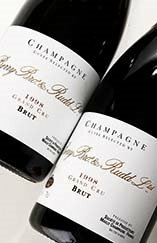 If you would like to find out more about Berry Bros’ food- and wine-matching courses, log on to www.bbr.com for details of forthcoming sessions.